Ho ho ho! Here we go! Let the holiday baking begin 🙂 Did you get up before dawn and go out with the masses to do all your holiday shopping? Or did you stay home and put up your Christmas tree? I’m decorating and staying in! I’m more of a cyber Monday kind-of shopper anyway. And why leave the warm house to battle crazy shoppers when there’s leftover turkey to be eaten? I started baking a little early this year and have four new cookie recipes to share. 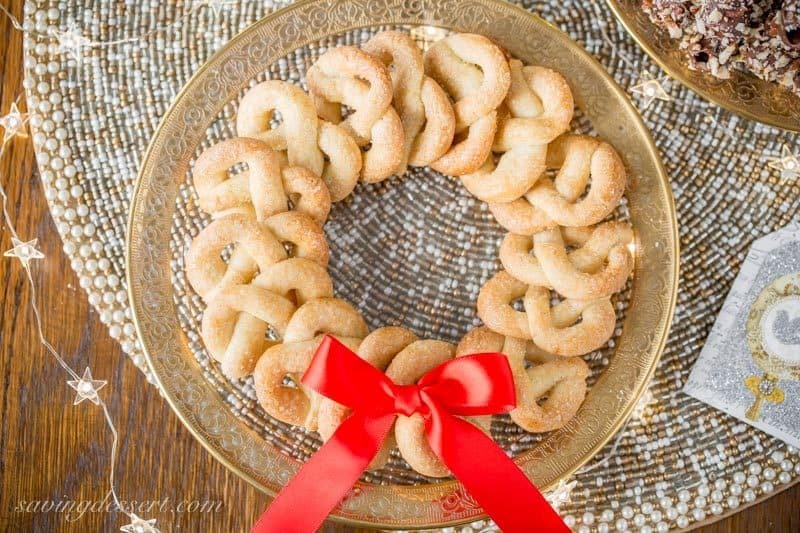 We’re starting with these Vanilla Pretzel Cookies which are so cute and fun to make! The dough freezes well for up to 2 weeks, then bake when ready to share. These are the kind of cookies everyone loves. They’re not messy, gooey or over the top sweet, they travel well and have a nice crunch without being dry. 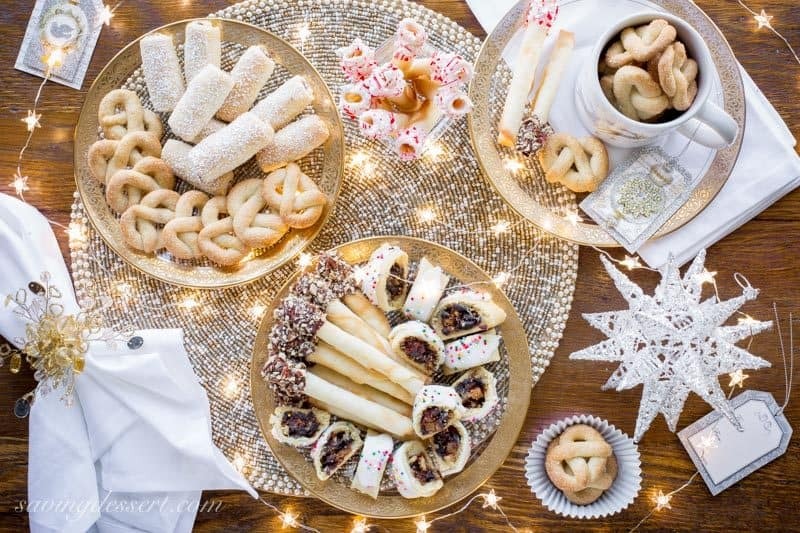 Pictured above (top left) Vanilla Pretzel Cookies, Roczki (or Kolacky), White Chocolate Peppermint Tuile Cigars, Italian Christmas Fig Cookies, and Milk Chocolate Pecan Tuile Cigars. 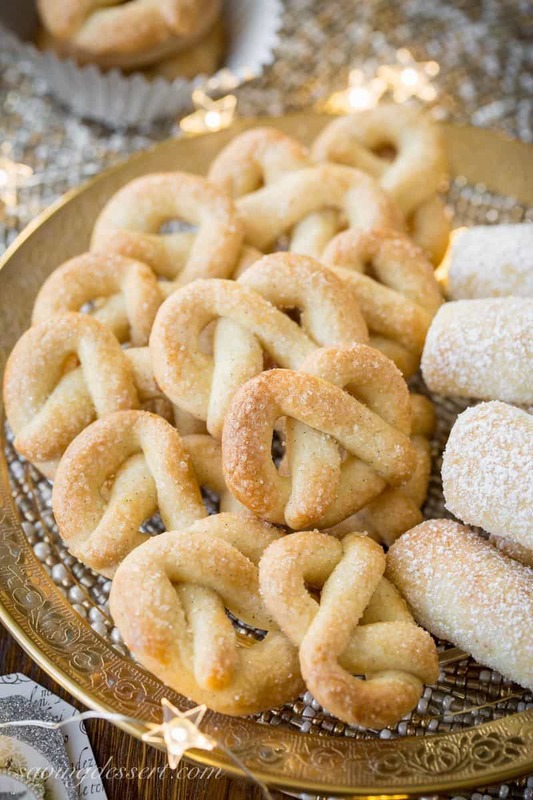 These Vanilla Pretzel Cookies are adapted from a recipe by America’s Test Kitchen. The thing that fascinated me most about this recipe, is that it’s made with a hard boiled egg yolk instead of raw. Apparently this is a traditional French ingredient /method which helps eliminate excess moisture thus giving the cookies their perfect sandy texture. 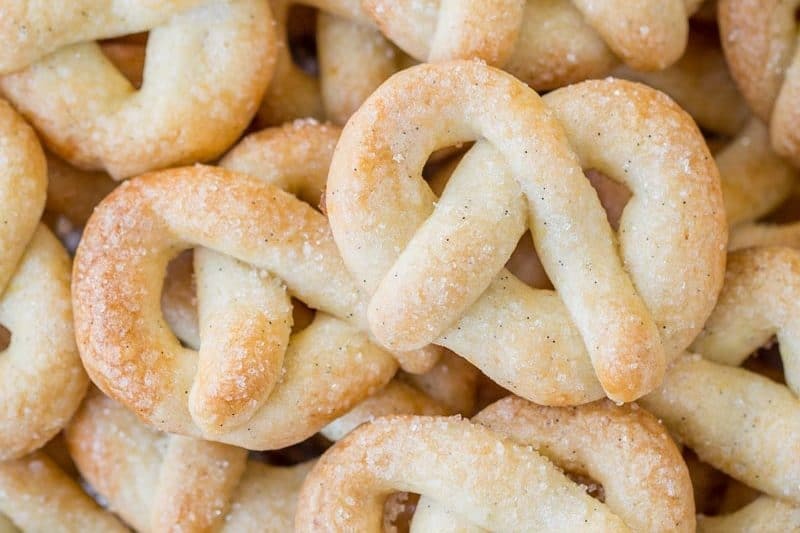 The dough is a dream to work with and these little pretzel shapes are super easy to make. Can’t you just picture a tin of these cookies wrapped up with a bow for your favorite neighbor, boss or best friend? So fun and super delicious! Place the egg in a small saucepan and cover with water. Bring to a boil over high heat then remove from the heat, cover and rest for 10 minutes. Fill a small bowl with ice water and set aside. Remove the egg from the pan and place in the ice water bath. Allow the egg to cool for 5 minutes. Crack and remove the peel. Remove the yolk and discard the white. Press the yolk through a fine-mesh strainer into the bowl of a stand mixer. Fit the stand mixer with the paddle attachment. Add the butter, granulated sugar, and salt to the cooked egg yolk. Beat on medium speed until light and fluffy, about 3-4 minutes. Scrape down the sides of the bowl and beat for another minute. With the mixer on low speed, add the vanilla bean paste and mix until blended. Add the flour and mix on low speed just until combined. With a rubber spatula, press the dough together in a cohesive mass. Divide the dough in half and roll each piece into a log 6 inches long. The diameter should be about 1 3/4 inches. Wrap each log in parchment paper and twist the ends to seal. Chill the dough for 30 minutes. The dough will not be hard but firm enough to handle without being sticky. Using a large thin knife (chef's knife), slice the dough into 1/4 inch thick rounds. Separate each of the rounds on the parchment paper. Roll each disc of dough into a ball, then roll into 6 inch long ropes. Form each rope into the pretzel shape and place 1 inch apart on the prepared baking sheet. Using a pastry brush, gently brush the egg white mixture over the tops of each cookie, then sprinkle with the coarse sugar. Bake for 15 minutes or until the centers are pale golden brown and the edges slightly darker. Cool the cookies on the baking sheet for 5 minutes then transfer to a wire rack to cool (or if using a rimless baking sheet, slide the parchment with cookies onto the cooling rack) Store cookies in an airtight container for up to 1 week. This Sugar in the Raw is readily available in larger grocery stores. If you’ve never tried one I highly encourage you to pick up one of these inexpensive Airbake cookie sheets. We love the way it bakes! Happy shopping, decorating, baking and whatever else you’re up to this weekend! Thanks so much for stopping by! I made about a dozen cookies from the recipe, when I divided the dough in two I had about an inch and a quarter thick rope about 6 inches long. Did I miss something? Hi Carol – Perhaps you missed one of the steps. If you make the dough and bring it together in a cohesive mass, then divide that in two, you should then roll each into a 6″ log. From there you refrigerate the dough and then follow the directions in STEP 6: “Using a large thin knife (chef’s knife), slice the dough into ¼ inch thick rounds. Separate each of the rounds on the parchment paper. Roll each disc of dough into a ball, then roll into 6 inch long ropes. Form each rope into the pretzel shape and place 1 inch apart on the prepared baking sheet. Using a pastry brush, gently brush the egg white mixture over the tops of each cookie, then sprinkle with the coarse sugar.” Maybe the math got messed up – if you have a 6-inch long and cut it into 1/4″ slices, that would be four slices per inch x 6 inches = 24 discs out of each 6-inch log. So 24×2=48 cookies. Hope that helps. This recipe looks soon good. Hi Therese – in the United States we often break measurements down to as little as possible in case you would like to half or double a recipe. Butter, in particular, is packaged in sticks and each stick is marked with lines at each tablespoon. One stick of butter equals 8 tablespoons or 1/2 cup. You don’t have to scoop the butter into a tablespoon 10 or 12 times, you just use one stick of butter plus the additional tablespoons necessary to make up the difference. You can use a knife and cut the stick of butter, directly through the paper. Hope that explains it a little better. For this delicious recipe you will need 1 stick of butter plus 2 tablespoons. That is 1/2 cup plus 2 tablespoons or 1/8 cup. Measuring by the amount of tablespoons seemed the best choice in this recipe. Hope you’ll give them a try – they are amazing and so buttery and crisp. An absolute favorite in our family! Holy wow! I have, I think, had something like this in the past, but man, it’s been a longtime… Vanilla is my favorite flavor ever! You’re lucky I am not in your kitchen because you would not have any of these left after about 3 minutes. They really disappeared quickly Gigi – and so much fun to make. Enjoy and thanks for stopping by! These are SO SO pretty, and I love the styling with those star lights! I actually went out Friday to make a return. Bad idea! The place was a mob scene. Lesson learned 🙂 I was surprised at how many people still love to shop in stores. I’m more of a cyber gal myself AND I love a simple, buttery cookie! These look wonderful! Thank you Susan – they are great little cookies and so simple. I would have thought Black Friday shopping would diminish with the availability of all thing internet! Sorry you had to experience the fun – haha. Happy baking and have a great week Susan! Hope you had a lovely Thanksgiving. Woah, Tricia! Lovely, lovely…that first photo with all the treats you’re going to share is like a winter wonderland of cookies. It looks very dreamy and beautiful! : ) I’m glad you stayed home to bake for us. I hope you had a great Thanksgiving – we went on a little road trip but I’m back and ready to see what’s baking! And I love these pretzel cookies to start! I’ve always wanted to make pretzel shape cookies and to mimic the ones in the blue tins. I have heard of this recipe with the egg yolk and I’m so glad to know from a trusted source (you!) that it works. Great bake and look forward to seeing more of the rest! Welcome back Monica! I am very excited to see what you’re baking this year. You are going to love these pretzel cookies and they really are easy to make. The dough is just dreamy to work with. I was thrilled with the amazing flavor and perfect texture. Enjoy and thank you so much! Hi Robyn – we did have a lovely time and ate way too much. Everything was delicious and we all had a wonderful visit. In Canada, when do people typically decorate for Christmas? Have a great weekend and thanks so much for stopping by! they are adorable! I love the sound of that dough and i’m a dough kinda guy so I will be making these… your description of the preparation for Christmas makes me yearn for a wonderful old-fashioned christmas… which I am having! Can’t wait! Thank you very much Dom! An old fashioned London Christmas – that sound enchanting! These look so delicate and beautiful. How would you freeze these tasty little morsels?? These cookies are lovely! How pretty they would look on a platter, outshining all of the boring round cookies. 😉 I’ve made chocolate pretzel cookies, but it’s the vanilla ones I remember from the tins of butter cookies from my childhood. I am excited to try these. The cooked egg yolk is new to me and so intriguing! I was reminded on the butter cookies in the tins too Wendy – love them! I’ll have to check out your chocolate pretzel cookies – they sound wonderful! Hope you and your family had a wonderful Thanksgiving! 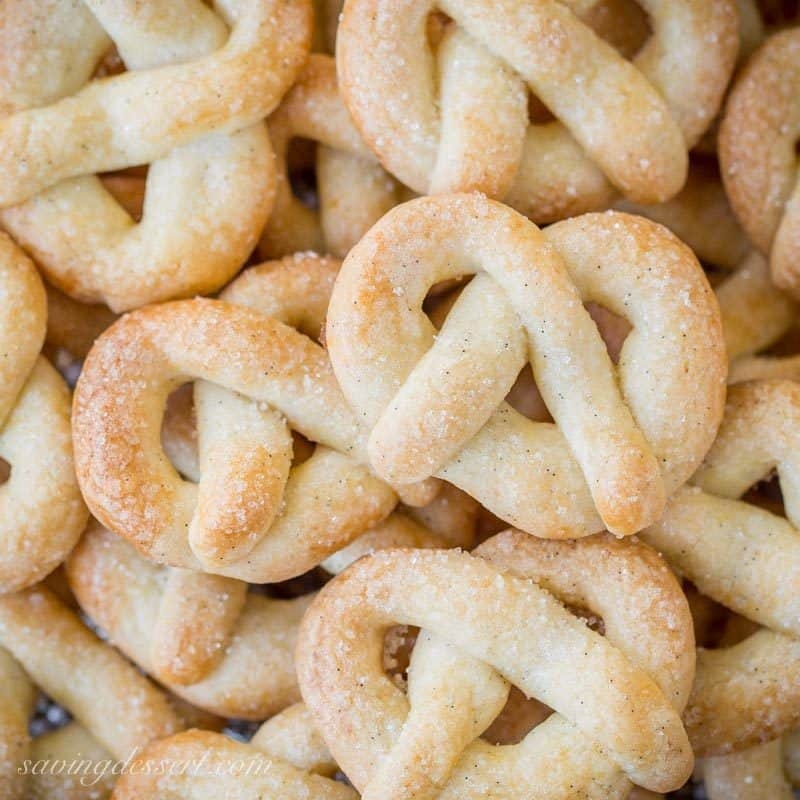 Tricia , I love this cute little pretzel cookies. I am going to pin them and make them soon. I have never used vanilla paste but I am seeing it in a lot of recipes. Where to you get yours? Could you substitute vanilla seeds from vanilla beans? No shopping for me, I am baking a Linzer Torte for my friends and my next blog post. Hi Gerlinde – vanilla extract is fine or even a combination of extract and beans. The paste is so popular now, it’s easy to find in the grocery store right next to the extracts. I love baking with it. Can’t wait to see your Linzer Torte – it sounds lovely! oh my goodness, I just love these, these are one of my all time favorite shaped cookies. There was a bakery where I grew up that made the yummiest pretzel cookies. These are a must make for sure! Thanks Diane! Hope you had a wonderful Thanksgiving. So glad you’re going to make these cookies – they are terrific! You are so ahead of me! Thanks for this one..and the next ones..:)Lovely pics! Thank you Monique! Have a lovely weekend. Such pretty cookies! Love the shape and the vanilla flavour. Can’t wait to see all your delicious cookies 🙂 Hope you had a wonderful Thanksgiving! We had a lovely Thanksgiving Jennifer – thanks so much! Cookies are so fun to bake at the holidays – and especially great to share. Hope you have a nice weekend! I have an Italian sugar cookie recipe that’s made with hard cooked eggs. It sounded so weird to me but the cookies are fantastic. These look fantastic too and I love the shape! I agree Chris – it’s a pretty cool way to bake with eggs! Hope you and Scott had a lovely Thanksgiving. Happy baking! I love that wreath, what a fun idea! No shopping for me today, it’s baking all the way! I can’t wait to see your other recipes, I’m all about cookies this week. I can’t wait to see what you post Sue! Hope you had a wonderful Thanksgiving. Thanks so much! Buttery, crisp and ever so beautiful! They are buttery, crisp and so good Angie! Thanks – have a great weekend.